Kaley Cuoco and Jim Parsons joined Brad Goreski on E! 's Live From the Red Carpet at the 23rd Annual Screen Actors Guild Awards and revealed why they're fighting. While Parsons—who donned Armani—is part of the Big Bang Theory's nomination for Outstanding Performance by an Ensemble in a Comedy Series, he's also a part of Hidden Figures' nod for Outstanding Performance by a Cast in a Motion Picture. When asked about the double nomination, Parsons gushed, "It's more exciting than I even thought it would be, I'll be honest with you. When it happened it was really neat, but it was really on the ride over I was tonight like, 'Oh my God, I have two groups of people I get to see!' It's kind of overwhelming in that way!" 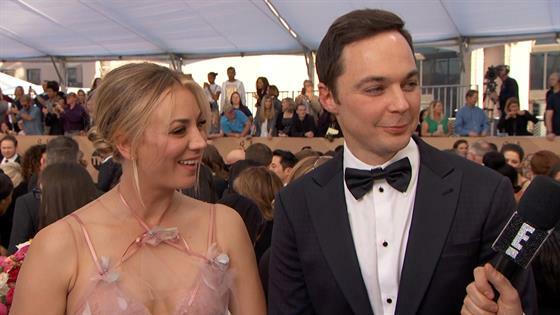 Unbeknownst to Cuoco, however, he revealed he would be spending the night sitting at the table with the cast of Hidden Figures, rather than the Big Bang Theory. "I was only part of that decision!" Parsons revealed, explaining, "Here's what happens: you can't sit in both." Cuoco—who donned a Marchesa gown—interrupted him, asking, "Do you hear this? He just moves right into the Hidden Figures table. OK! This is news to me, if you can't tell." Parsons promised he told everyone on the Big Bang Theory cast about the seating arrangement "weeks ago" and noted, "They have kindly put our tables close together." Cuoco wasn't having it, joking, "Would it be weird if I sat at the Modern Family table?" And Parsons continued along with her kidding, adding, "You broke the news! There's in-fighting on Big Bang!" All joking aside, though, the two promised viewers they really do love each other. We'll see if Parsons takes home two awards tonight when the 2017 SAG Awards air at 5 p.m. PST on TBS And TNT.